Here’s the two piece, custom dock to ground ramp that we created. 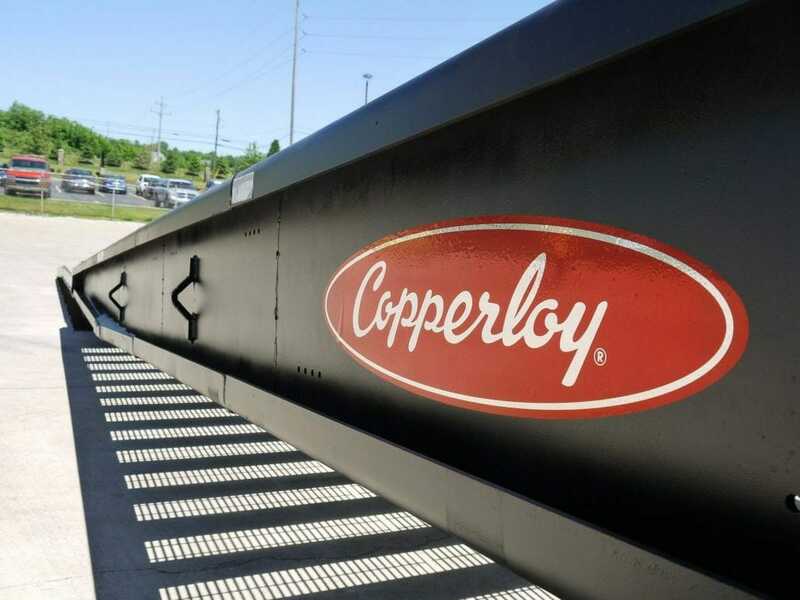 With over 60 years of experience in manufacturing and selling yard ramps, Copperloy is a name people trust when looking for durable, industry leading yard ramps. At Copperloy, we also offer our customers the option of tailor-made ramps to take on any unique challenge or specification. We have an in-house engineering team of skilled experts and are always excited to take on new challenges. When one of our local clients asked for help with a specialty ramp, we were more than happy to oblige. The company is wire and cable manufacturer called TPC Wire & Cable Corp. 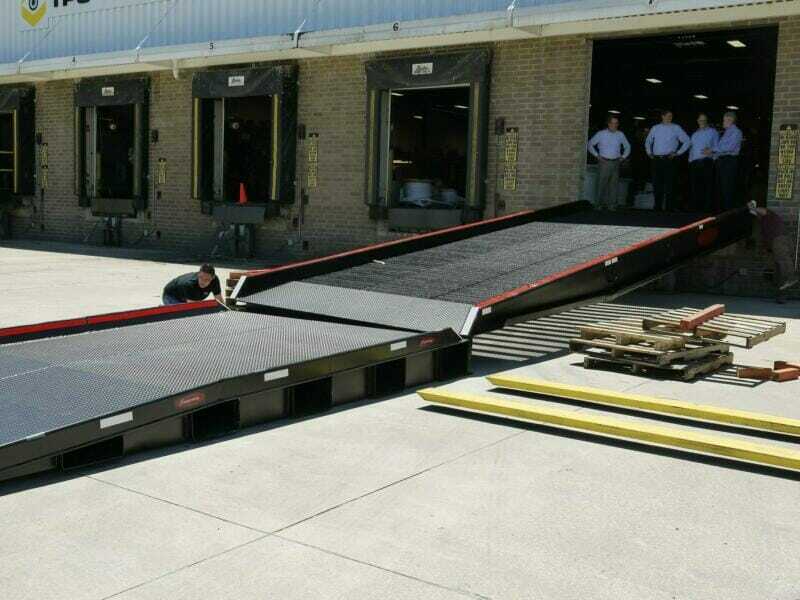 They are located in Macedonia, Ohio and needed a ramp to meet a few different specifications. We started with their main priority. They were looking for a ramp that allowed trailers with low clearance to drive into their building. A key requirement was for a truck to be able to drive up the ramp into the loading facility. Copperloy was able to achieve just that. Since they make industrial wire and cable, they also needed a ramp that could handle the large weight capacities of the trucks plus the cable or wire. TPC Wire & Cable Corp also needed a ramp long enough for large trailers to get into their building, without hitting the ceiling. After researching more about TPC Wire & Cable Corp.’s needs, Copperloy’s engineering team decided that the best answer was to design a unique 2 piece ramp design. This 2 piece option answered the company’s unique specifications, while also making shipping and unloading a painless task. When joined together, the dock-to-ground ramp is 50 feet long, so we had to get creative as to how it would be best to manufacture and transport to TPC Wire & Cable Corp. Since this ramp was designed in two pieces, the first ramp is 30 feet long, by 10 feet wide. It gives the trailers space to navigate, while also providing a 30,000 pound capacity. It’s made of steel, with serrated grating, for better traction and durability. The 20 foot extension to this ramp locks into place for easy installation. This saves the user the need to manually bolt the ramps together, while offering peace of mind in Copperloy’s safety procedures and factory certification. 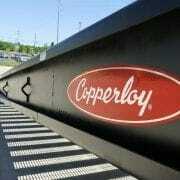 At Copperloy, we want to provide our customers with a hassle-free experience. Although this ramp is a custom design, we still manufactured it for ease of use and safety. TPC Wire & Cable Corp. was concerned about trailers hitting the ceiling during the loading and unloading process at their facility, Copperloy’s 50 foot ramp with custom bends on the extension piece answered this concern. 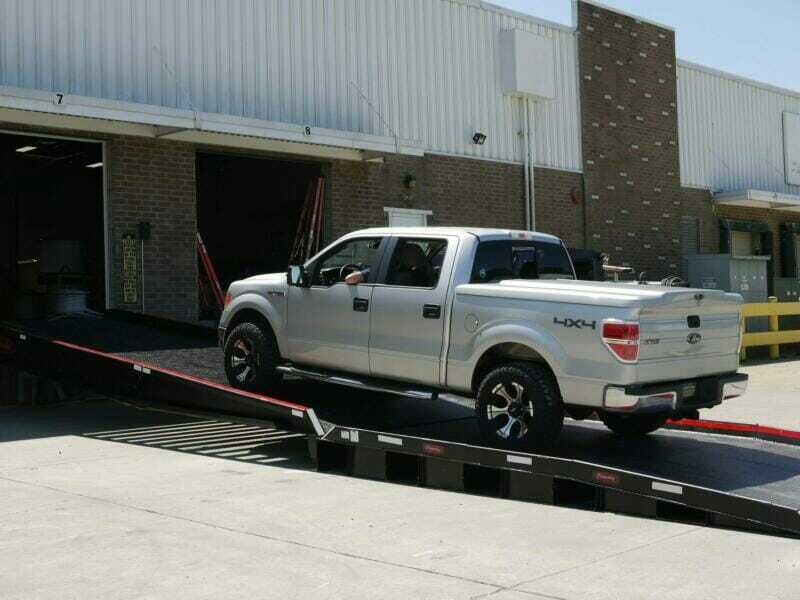 Put together, this high strength, steel yard ramp allows for 50,000 pound minimum yield and versatility. This custom-designed, stationary yard ramp is also built to last, using high-quality materials. Copperloy offers customers a wide variety of American made mobile yard ramps that provide a loading and unloading facility where one isn’t already established. This wide range of equipment includes: mobile yard ramps, dock-to-ground ramps, truck ramps, and forklift ramps. Our yard ramps are available to rent or buy. In addition to yard ramps, Copperloy also manufactures a range of material handling equipment, including edge of dock levelers, dock lifts, lift tables, dock boards, rail boards, dock plates, and portable platforms. As seen with TPC Wire & Cable Corp., we also provide custom manufacturing and steel fabrication services to meet any business’s unique needs and demands. Copperloy provides a variety of other options to help ease the loading and unloading process, making freight easy and accessible. Learn more about what Copperloy can do for your unique application or specification, by calling us directly at 800-321-4968.